Curved and Straight Stair Lifts from Sterling. Click here to compare Ameriglide stairlift models and features. 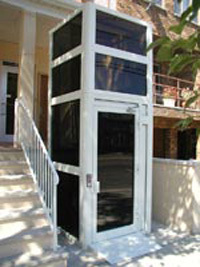 We offer wheelchair modular ramps that are ADA compliant and made of sturdy aluminum. Handrail extensions, guardrails and gates available. Pool and Aquatic Lifts for your pool, jacuzzi or boat. Click here to browse our ADA approved swimming pool lifts. Copyright © 2016 Advanced Mobility Inc. All Rights Reserved.